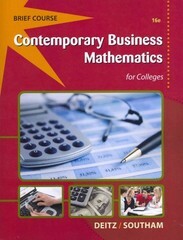 Contemporary Business Mathematics for Colleges, Brief (with Printed Access Card) 16 Edition CONTEMPORARY BUSINESS MATH FOR COLLEGES, BRIEF, 16TH EDITION presents a basic, arithmetic-based approach to business math. It emphasizes practical skill-building to prepare users for careers in business through step-by-step development of concepts, numerous practice exercises, and real-world application of techniques. The text progresses from the most basic to more complex business math topics. Additional assets to help users gain confidence in mathematics such tutorials, video clips, and more are available on the companion website.